Below are many of the new developments regarding each manufacturers TV Introductions and Offerings for 2013. Follow the links below or keep reading to see what each manufacturer has to offer this year. Samsung's CES booth was dominated in the front by Huge 4K UHD TVs. These were encased in large black frames. One or two were 110 inches. The picture quality on these varied a lot depending on whether it was showing 4K content or up-converting 1080p content (which was still impressive). There were several side booths set up to show how Samsung is obtaining better picture quality engineering techniques on their 4K UHD TVs. The size was quite impressive but from side viewing angles I though I detected some pretty severe contrast degradation on these TVs. There was also a nice sized dedicated OLED TV section with self emitting RGB technology. The black levels produced are astounding. There was one display where viewers could test a joint-view active 3D OLED TV display where side to side viewers can see very different content on the screen at the same time. The call this “multi-view 3D” capability. It sends active 3D 1080p to each eye and it worked well. I dont know how useful such a feature is, but it worked well nonetheless. Samsung announced that they are hoping for end 1st Half of 2013 to ship their OLED and UHD 4K TVs. Samsung had a very nice plasma TV display for its PN60F8500 top of the line plasma TV for 2013 which showed some remarkable improvement in both black levels at 4 times prior levels and also peak white and brighness levels – now equaling their best LED TVs in contrast ratio. PN64F8500, PN51F8500. Samsung's LED TV offerings were an extension of 2012's excellent offerings in terms of both styling and quality much like LG. Their top end UN55F8000 and UN60F7500 flagship LED models have a retractable camera and a remote control with voice interaction which works well for certain types of functions. Panasonic also had a display showing a 4K UHD OLED TV (56inch), but there was only one piece on display and though it looked great, there was no ETA on delivery this year. Their TV lineup was split evenly between LED TVs and Plasma TVs, with enhanced black levels in their new TC-P60ZT60 series which are pitch and look to be 20% better than the black levels of the VT50 series from last year which were an industry best. In a side to side comparison in a pitch black room, the ZT60 bested the VT50 by a large margin. The glass and metal design is again a focal point of the top end plasma and LED TVs. 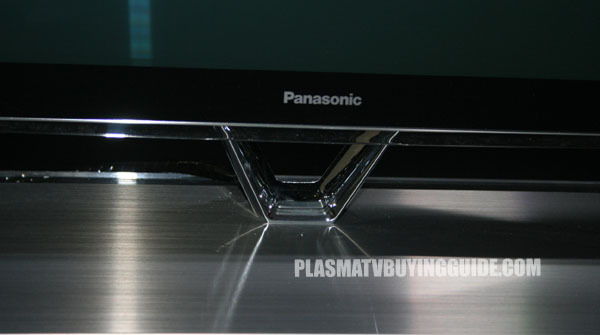 In the Panasonic LED TVs the same technologies from 2012 prevailed such as the super wide enhancement technology which helps wide viewing angles on LED TVs. The TC-L55WT60 replaces the TC-L55WT50 as the top of the line and has the addition of a retractable camera. All of the top of the line TVs in both technologies from Panasonic have the Swipe and Share feature which is a connectivity enhancement that allows your smart devices (ipad, iphone, tablet) to swipe that content to the TV using the same Wifi connection. Then you can modify it using the new pen touch technology and swipe it back to the tablet or Smart phone in modified form. Voice recognition from the small touch pad remote control is also a new feature, which helps speed browsing considerably but does little else well. Sony had it's new KDL-55W900A LED TV which will be one of the top of the line models for 2013 sharing space with the XBRHX950 series. This model was prominently displayed and picture quality techniques highlighted at several booths including one focusing on the X-reality Pro engine. Color accuracy and reproduction bump up the 'wow' factor of the W900A significantly. 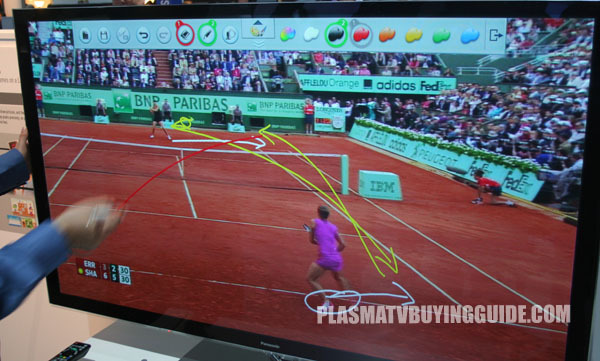 Sony really had lots of focus on the 4K UHD TV technology in their booth. There were many booths set up highlighting both the picture and sound quality of this impressive TV. They even have sizes already picked out, the XBR-65X900A, XBR-55X900A, and XBR-84X900A models. The included side speaker sound system is very impressive as is the passive 3D viewing on these TVs, which utilize LED backlighting. There was also on display an OLED 4K TV which was very impressive. Notably Missing from their 2013 CES show: Sony Crystal TV introduced last year at CES. Toshiba did not have much in the way of OLED TVs just some small displays showing how OLED screens can bend. The differentiating display they do have is their Multiparalax passive glasses-free 3D display technology which is much improved from last year and easily enjoyable – at least with the animated content they provided. 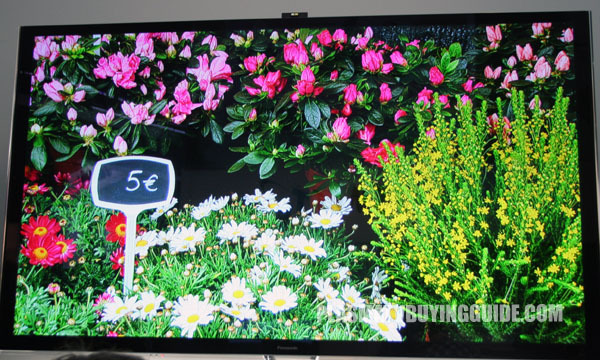 They also showed the L9300 series UHD 4K LED TVs in comparison to a normal 1080p LED TV display. A weakness we noted was side angle viewing contrast degrading. They stated that they are shipping 3 sizes of this TV in Summer 2013. Notably missing from their booth at CES 2013: Passive 3D viewing stations and not much on OLED. Sharp stays the course with it's super large sized LED TVs with 3 new lines for 2013. The company also stated that they will introduce a 4K UHD LED TV in 2013 and had prototypes present in 60 inch and 70 inch sizes. They also provided displays of their new IGZO energy saving technology that was displayed in a 32 inch size 4K TV. It's primarily function is saving battery life in the pixel-dense LCD portable TVs and tablets of the future. 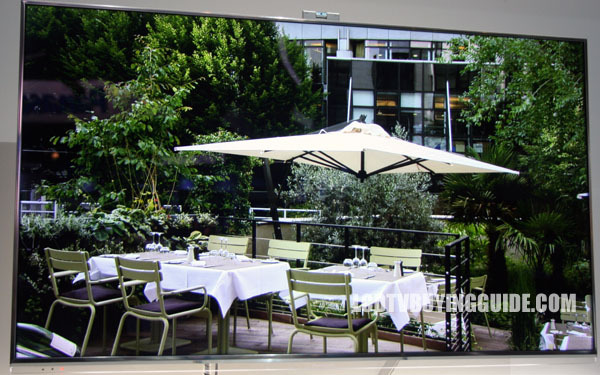 In addition the company again had its 7,680 pixel 8K LED TV on display. Last year, I was blown away but the detail offered, but this year after having seen some very good 4K OLED and 4K LED Televisions samples, I was not as impressed. Notably missing from the Sharp booth from 2012 CES: Their portable LED-LCD TVs, which they planned to introduce last year. Vizio continued to concentrate and introduce their very large size LED TV offerings with Smart TV options.